Zhu Mingyue, founder and CEO of Chongqing Zhubajie Network Technology Co Ltd, said his company has already set up offices in Houston in the US and Toronto in Canada. When a Chinese restaurant owner in Silicon Valley needs a logo or a menu design, he or she will probably log in to Zhubajie.com, China's largest platform for online creative services. 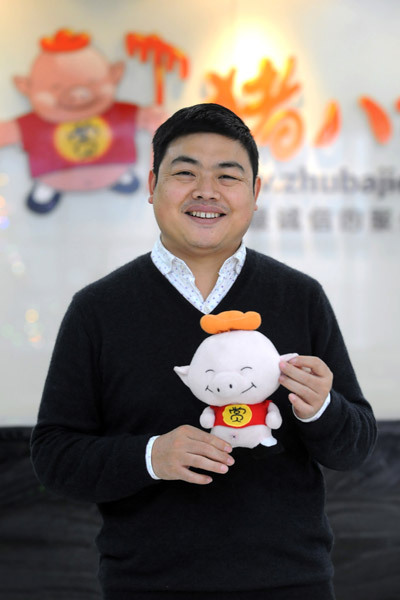 After eight years of losses, Zhubajie is expected to turn profitable this year. Its current worth is estimated to be more than 10 billion yuan ($1.5 billion). By the end of 2015, Zhubajie has about 15 million registered users and the annual turnover was 7.5 billion yuan. "Every ten minutes, there is a proposal from overseas," said Zhu Mingyue, founder and CEO of Chongqing Zhubajie Network Technology Co Ltd, the company that operates Zhubajie.com. Zhubajie, a major character in the Ming dynasty (AD 1368-1644) novel Pilgrimage to the West, supposedly reincarnated as a pig. Its international English-language portal Witmart.com serves customers from all over the world, including the United States, Canada and Britain. "Our services cover 25 countries and regions," said Zhu, a former local newspaper reporter. The success of Alibaba, China's e-commerce giant, makes Zhu upbeat about the prospects of Zhubajie as it expands worldwide. "Compared with online goods trade, our services trade has no constraints in terms of logistics and customs. It is very promising." The company has already set up offices in Houston in the US and Toronto in Canada. "We are based in China and mainly serve the Chinese clients, but we aim at the global market." Zhu founded the company in 2006 in the Southwestern municipality of Chongqing. From a small studio, it has grown into a large Internet-based platform for outsourced creative services. Service providers, typically designers and advertisers, trade with three million budget-minded small and medium companies on Zhubajie. Its popular services include logo design, web design, translation, copywriting and marketing. In September last year, the company launched a new business: trademark registration and other intellectual property rights protection services. "As more and more Chinese small and medium companies go abroad and foreign ones come in to China, they need a reliable and affordable service for their trademark registration," Zhu said. In partnership with local professionals, the company can get such business done in China, the US, Canada and the European Union countries. For example, to get a trademark registered in the US, the standard package of services cost $1,000. In case of application denial, the client can get a full refund and 25 percent compensation. Zhubajie's innovative business model evolved throughout its nine years of existence, and today includes free trademark search and money-back guarantee. "Now we get 1,000 orders every day and the figure is expected to reach 6,000 per day next year," Zhu said. In June 2015, the website announced it has changed its business model and stopped collecting the 20 percent commission from each deal. It is also an incubator of startups. The company is hoping to ride its new businesses like trademark registration, printing and financing to a revenue of 10 billion yuan this year. That would mark a long distance from the time it used to depend on venture capital for survival and growth. For instance, in 2007, the then one-year-old company received 10 million yuan in two tranches from a local IT company Chongqing Born Group. In 2011, it received a $10-million investment from International Data Group Corp, a US-based technology, media, research and events management firm. In June last year, it got a cash injection of 2.6 billion yuan, the largest of its kind in China's services sector and the largest Internet-related investment in West China. Owing to the success on its home turf, Zhubajie gave up its plan to list on the Nasdaq Stock Market. The June 2015 funding, however, has sped up its plans for a local float. "We have already kicked up the initial public offering procedure in China," Zhu said.